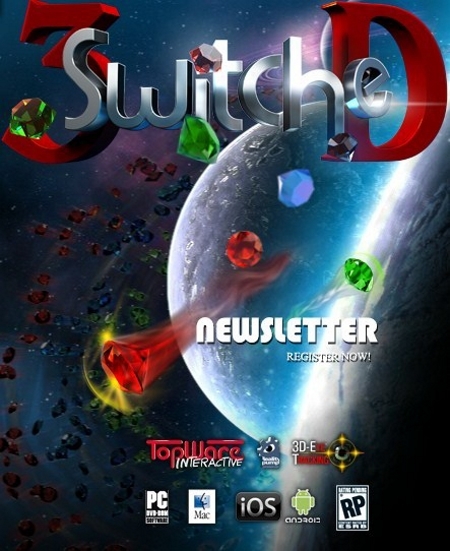 3SWITCHED-RELOADED ~ The Best GamEs.. SpOt !!! Thanks to brilliant 3D-graphics and new technology, a cult classic has been transformed into a highly addictive masterpiece. “3SwitcheD” offers six diversified challenges and uncounted hours of gaming fun, including unlockable bonus levels and the never-ending chase for the elusive high score. The innovative 3D-ETTM Face-Tracking Technology takes your game to the next level: a camera will scan your movement in front of the screen in real time! The unique technology analyzes the position of your face in relation to the screen, and adjusts the playing field in real time as you target diamonds!Thanks to brilliant 3D-graphics and new technology, a cult classic has been transformed into a highly addictive masterpiece. “3SwitcheD” offers six diversified challenges and uncounted hours of gaming fun, including unlockable bonus levels and the never-ending chase for the elusive high score. The innovative 3D-ETTM Face-Tracking Technology takes your game to the next level: a camera will scan your movement in front of the screen in real time! The unique technology analyzes the position of your face in relation to the screen, and adjusts the playing field in real time as you target diamonds! An innovative 3D-edition of a cult classic Six different game modes. Strategically move diamonds to gain access to score-multiplying bonus levels in Clearing Clusters. Sprint into high scores by quickly combining diamonds in Snazzy Swap. In Falling Stars, your only enemy is the clock. Make rows and columns of diamonds as long as possible, but be careful of overcrowding the playing field! In Pathfinder, move diamonds strategically to keep the paths open. In Moving 4-ward, bonus events will test your gem swapping strategies. In Gravity Switch, up is down and down is up! Use the changing gravity fields to your advantage and gain access to the bonus multiplier levels! Easy to learn gameplay with high replay value State of the art graphics guarantees optical bliss Choose between 2 harmonious sound tracks / music scores Professional voice recordings, with the option to choose between a male and a female voice Supports 3D-ET™ Technology Track your score against others online! Two modes with bonus-levels!